Sharon Carrillo, 33, at the Waldo County Superior Court on Feb. 28, 2018. A woman accused of beating to death her 10-year-old daughter in Stockton Springs in February gave birth to a baby boy, according to her lawyer. Sharon Carrillo gave birth to a baby boy on Wednesday, said Chris MacLean of Camden. NewsCenter Maine reported Wednesday night that the newborn is named Nicholas Isaiah. Sharon Carrillo, 33, and her husband, Julio Carrillo, 51, have been charged with depraved indifference murder in the death of Sharon’s 10-year-old daughter Marissa Kennedy. The couple pleaded not guilty in April. The Carrillos are being held at Two Bridges Regional Jail in Wiscasset, where Sharon Carrillo is expected to return to after recovering from the birth. The Carrillos have been held there, unable to post a $500,000 cash bail, since their arrest in February. The boy born Wednesday was the couple’s third child together. Their two sons — Luis and Emmie — were ages 1 and 2 when the Carrillos were arrested. Julio’s parents, Julio Carrillo Sr. and Carmen Carrillo, have received court approval to become foster parents for all three children, including newborn Nicholas, said Julio Carrillo’s lawyer, Darrick X. Banda of Augusta. 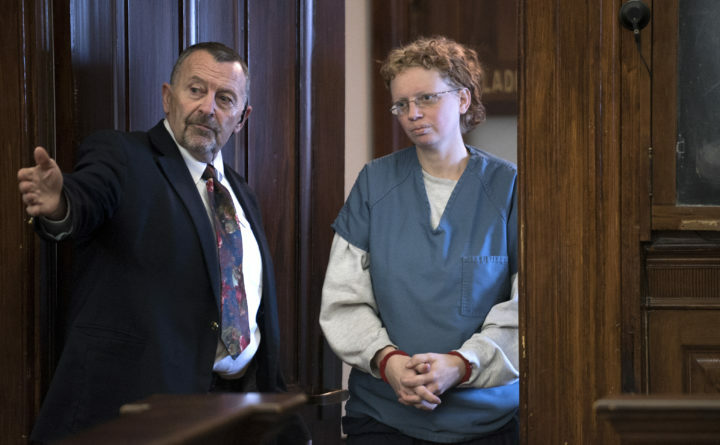 Since Marissa’s death, prosecutors have alleged the couple beat the 10-year-old on almost a daily basis for months, using fists, belts and a mop handle. Marissa was found dead in the Carrillos’ basement on Feb. 25 in a scene the couple had staged to make it seem like she had fallen while playing. Investigators have said in court documents that the Carrillos admitted to participating in the abuse and attempted coverup. Sharon was a single mother for six years before meeting Julio in 2013. The couple moved to Maine in 2016 from New Windsor, New York. Before the Carrillos moved to Stockton Springs, the couple lived in a Bangor apartment building where a cleaning woman said she reported alleged abuse to a state social worker. Bangor school officials also said they made multiple reports of alleged abuse to state social workers. Marissa’s death sparked questions about the state’s child welfare system, leading the Legislature’s Government Oversight Committee to greenlight a probe into Maine’s child welfare system and the deaths of Marissa and 4-year-old Kendall Chick of Wiscasset, who died last December after she was allegedly killed by her grandfather’s fiance, Shawna L. Gatto, 43. A report released Thursday about state government’s role in protecting the two slain children from abuse faulted a Maine Department of Health and Human Services office for “poor job performance” and “inadequate supervision” in one of the cases, while in the other case the risk of abuse and neglect “was not necessarily evident” to those tasked with protecting the child. BDN writers Christopher Burns and Callie Ferguson contributed to this report. To locate your local Domestic Violence Resource Center, call the statewide helpline at 866-834-HELP (4357) or visit www.mcedv.org. For resources or support to prevent child abuse, call 800-422-4453.